Panoramic ocean views from sunrise to sunset! Quaint waterfront cottage with large deck and gorgeous views! NEW BUILD - House is currently being built and new pictures will be updated as available! 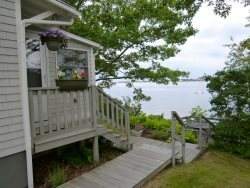 Classic Maine Cottage located on water's edge on Bailey Island walking distance to restaurants and shops. Waterfront cottage situated at the mouth of Mackerel Cove, amazing sunset views! Two bedroom cozy cottage with beautiful views of Mackerel Cove! Nautical Themed oceanfront cottage located at the head of beautiful Mackerel Cove! Classic Maine Cottage with astonishing easterly views located walking distance to Cedar Beach! Enjoy Easterly water views, a great yard and a peaceful location!